Shane Speal dives into some of the differences between fretted & fretless Cigar Box Guitars and the benefits of each. Hey Shane, is it better to learn on a fretted or slide cigar box guitar? Turns out, that’s a great question! When I built my first cigar box guitar over 20 years ago, it had no frets, no fret markers and was played 100% with a slide. For me, that was the perfect instrument because I wanted to play the deepest Delta blues possible. I wanted the music to be primitive, creaky and have that slight out-of-tune sound of old Smithsonian recordings. 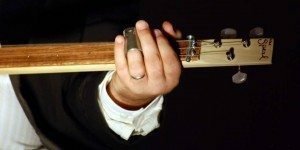 If you’re looking to capture the really old timey sound of a traditional cigar box guitar, then I suggest you shove a slide on your finger and grind away without frets. There’s nothing like the whining moan of metal against metal going up the neck. But wait!!! There’s also magic happening with the modern Cigar Box Guitar Revolution where people are bucking tradition and utilizing these homemade instruments for something new. They’re taking the concept of a homemade instrument and mixing it with new sounds they have in their heads. If you’re not looking for the old time creaky stuff, then a fretted cigar box guitar may be the right tool for you. Even a simple 3-string fretted cigar box guitar will allow you to play rock power chords, dulcimer-style passages and whatever your fertile brain can imagine. The lesson here is to simply think about what you want to accomplish and then choose the right tool for the job. The cigar box guitar is an instrument borne from American poverty back in the days even before The Great The Depression. The builders and players simply were searching for a sound they couldn’t afford to purchase, so they made their own. Be like them. Follow the sound. I have been working with C. B. Gitty Crafter Supply in creating a library of free cigar box guitar lessons. Although we are still in the early stages of this project, you can still get a wealth of lessons at their sister site, CigarBoxGuitar.com. In addition, I have posted my easy-to-follow video series at ShaneSpeal.com. BTW, when I perform, half of my instruments are fretless and half are fretted. Since my music encompasses a wide range of mutant styles, I need many guitars to perform a 3 hour bar gig. Speaking of mutant styles, here’s a freakish video I filmed last night as I was practicing sitar sounds with a 3-string cigar box guitar. If you just can’t decide between fretted or fretless, then heck with it – build (or buy) one of each! There is no rule that says you can only learn one, and having both styles in your trick bag will only help you become a better player.